Stone floors are popular for a variety of reasons; they are durable, beautiful, classic and natural. However, installing stone flooring can be a bit daunting. While making the choice to use stone flooring in a room is simple, questions abound as to what types of stone flooring to choose, how it should be installed, and the best way to care for it. Let us address some of the most common questions about quartzite stone flooring for you! To begin with, let’s look at the make-up and appearance of quartzite stone. Quartzite (most commonly referred to as Quartz) is the stone resulting from sandstone being compressed by heat and pressure over millions of years. This compression results in an incredibly strong stone with a glassy, smooth appearance comparable to marble, slate or granite. It is mined across the Southern and Midwestern states, and into the mountainous regions of Canada, as well as in European countries and the UK. There are also quartz mines in South American countries, like Brazil. Quartzite mined from each region has a unique appearance resulting from the surrounding minerals of the area. 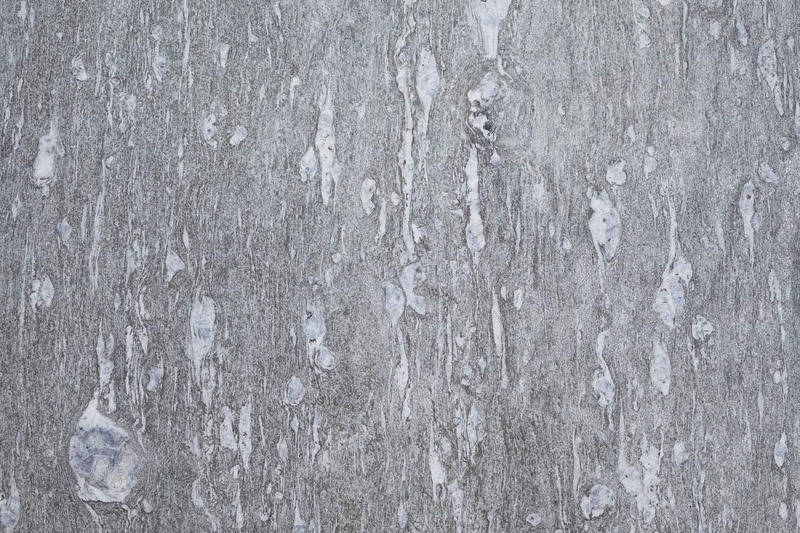 Quartz is generally used anywhere that marble and slate are used, including as countertops, in railway ballast, to cover walls or as grand staircases. Pure quartzite is greyish to white in color. Often, quartzite is streaked and patterned with pink, brown, or red deposits, most often iron oxides. Other colors may appear in quartzite flooring due to different mineral deposits. Depending on where the quartz has been mined, the coloration can range from a fairly uniform solid to a bold, swirling pattern of streaks and lenses. These patterns form as a result of the sandstone undergoing the great heat and pressure of being compressed along the tectonic plates of the Earth’s crust. The result is a beautiful texture and unique appearance to each stone. 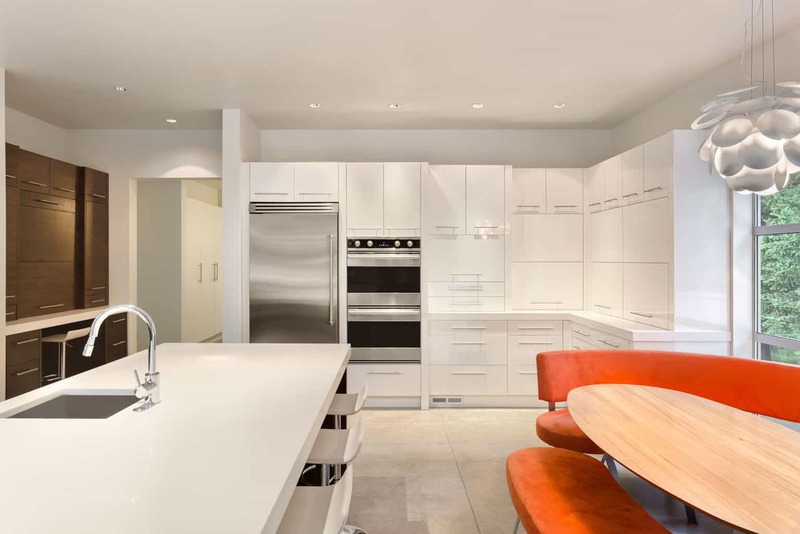 One of the most important things to understand about quartz is that, due to the strength of the stone as a result of the formation, quartzite is both heat and scratch resistant, making it highly desirable as a lasting flooring material. Quartzite flooring is quite dense and extremely heavy. Just 165 square feet of such quartzite flooring can weigh a physical ton. Typically, quartzite flooring is purchased as tiles which can range from one-half to one inch in thickness. This type of stone tile is also extremely hard, ranking 7 on the MOH mineral hardness scale (to give you a comparison, diamond ranks 10 on the MOH scale). In fact, the reason crushed quartzite is used as railroad track ballast is because it is so lasting and durable. There are two ways of finishing quartzite for use in home surfaces. Polished quartzite is very smooth and shiny. The act of polishing also brings out the color and patterns inherent in the stone. Polished quartzite is typically seen used as countertops, walls, vanities, sinks, and other non-traffic surfaces. Very shiny quartzite is also extremely slick though, so it is not well suited for floors. Honed quartzite is a satin finish with an attractive glow to it that really gives a high end look. On floors, honed quartzite is preferred because it provides better footing than the glossier quartz and the finish will hold up better over time. The negative with the honed quartzite is that it tends to show dirt more than polished quartzite because it is more porous, but it can withstand stronger cleaning agents without losing the finish. Like all stone flooring, quartzite flooring should be sealed when it is laid and every few years thereafter. Sealing helps minimize stains. The body of the quartzite is mostly white or grey in color and thus the most favorable choice for a classy look at home or work place. Wet the quartzite flooring first, with hot but not boiling clean water. Then, using a mildly abrasive, alkaline cleaner and a medium bristle brush like this one on amazon, wash in swirling, overlapping strokes. Suds can be left on for a while to allow bleaching agents to work on stains. Rinse thoroughly, then mop dry with clean cotton, flannel, burlap, or chamois cloth. It is important to dry well to avoid streaks. Cleaning up slicks instantly is very important in order to avoid any damage. Usage of any sort of acid or bathroom cleaners should be avoided for quartzite floors. 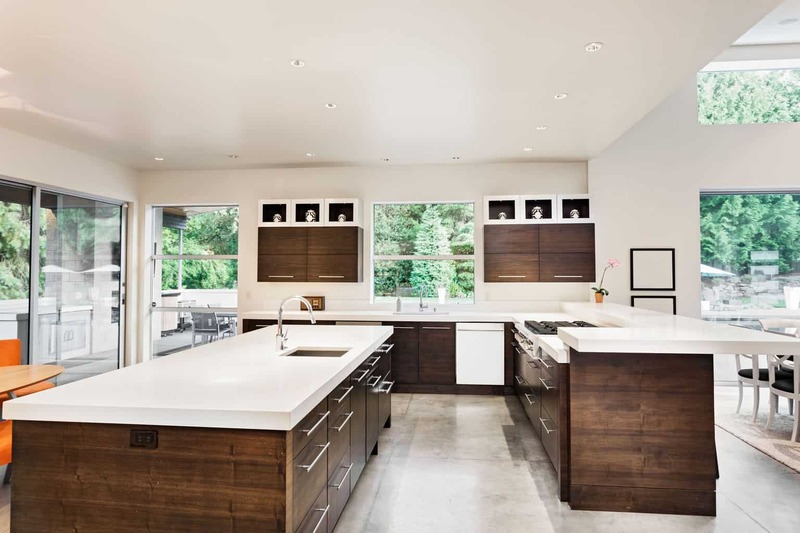 If extra-strength cleaning is needed on a quartzite floor, a paste of mildly abrasive alkaline cleaner and water, about the consistency of syrup, can be used. Apply the paste uniformly and allow it to dry. Then, use a medium bristle brush and clean water to scrub vigorously. Rinse and dry as described above. Few flooring options can compare to the glamour and class of a natural stone flooring. Slate, marble and quartz floors are in a class all of their own. The colorways of a quartz flooring are available in a range to meet any color scheme, but the overall effect is always the same: a high-end, clean, beautiful floor. There is no way around this, any natural stone flooring is on the pricier end. 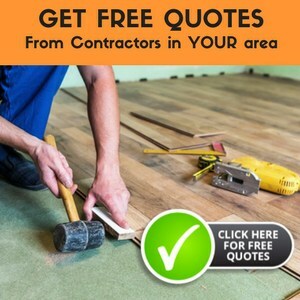 However, if you take into count just how long the flooring will last, it really is an investment unlike any other flooring option. To reduce the overall cost, you can purchase quartzite tiles that are slightly thinner. While this does sacrifice some of the durability, the MOH in general is still sufficient that the thinner options should work fine for a residential setting. 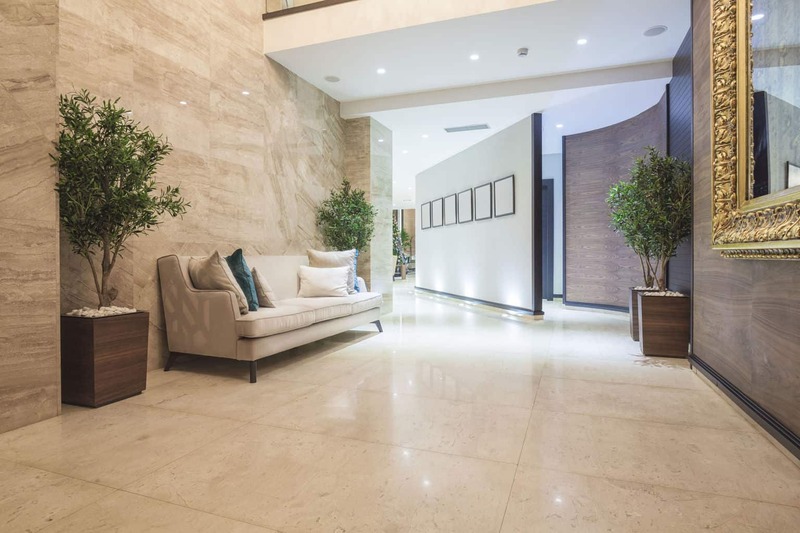 However, if you’re looking to put quartzite flooring in an office or somewhere like the lobby of a hotel where you anticipate a lot of heavy foot traffic, definitely invest in the heavier quartzite tile flooring options. Take into mind here the statues and buildings of the ancient Romans that are still available for you to appreciate today. Those are typically marble calcite, which is a 3 on the MOH scale. In case you missed it, the MOH of quartz is a 7! Your quartzite flooring is sure to last for generations. That being said, these tiles do break when struck exactly right (say, by a dropped heavy item). Because the colorways of quartz are so region and type-specific, it is a good idea to have a selection of extra tiles from the same batch saved in case of such an accident. It’s certainly easier than hunting around for an exact match decades later. While the installation is not, the maintenance of quartzite flooring is very simple. Keep it clean, use gentle cleaning agents, and reseal as directed by the manufacturer, and your quartzite floors will maintain their beauty and gleam. Quartzite flooring is extremely durable and beautiful. It’s also expensive, but worth having in high-traffic areas and where appearances matter most. Quartzite flooring tiles are mostly used to fit a contemporary and modern décor for houses and offices, but the timeless look of a natural stone tile flooring is unquestionable. Do you know of any floor scrubber machines that can be used on quartzite flooring? What are you trying to do? Are you wanting to clean it, strip it, or something else? What kind of problem does your floor have that you’re wanting to use a floor scrubber? Just asking, as an answer is most difficult to formulate without knowing what issues you are having with your floor. Great article! I have installed a quartzite tile floor several years ago that has a very rough, uneven surface. I did seal it after installation. The floor gets very dirty with food spills, etc and I find it hard to clean with just water. If I use Soft Scrub w/ Bleach or powder cleansers with bleach such as Bon Ami, will I have to reseal it afterwards? Is there any I risk discoloring the floor from the bleach? Thanks in advance. I am putting polished quartzite on my kitchen counters. someone told me that it is very porous and need to be sealed every 3 months. I understood that it was better at withstanding abuse than granite. From reading this article it does not have to be sealed but every few years and does not stain easily. If it does can I clean with soft scrub to get the stain out, because I will be using it on my center island for chopping and not loose the shine. It is a green color cut across. Routine cleaning may be done with a damp cloth or paper towel and, if necessary, a small amount of non-bleach, nonabrasive cleanser. How do you install the quartzite. We want to install 1500 sqft on the 2nd floor in the kitchen ,living room and more. Using a 1 1/2 ” – 2″ motar bed will add a lot of weight. We have @1″ thick quartz could we use thin set? I am putting in a soft water system (potassium). Do you know if this will damage my quartzite flooring? We live in Arizona and the PH is above 10-13 . I am wondering if not putting in a soft water system is damaging the floors. Water softeners are a good addition to a home. The softened water should not damage the quartzite. The hard water would not necessarily damage the quartzite, but it could cause build up which will be harder to clean. I have a field stone entrance hallway (8’x 8′)and keep stubbing my toes because it is uneven. I would like to replace it with quartzite if possible. The house is in an area where there is at least 6 months of snow. Do you know if this will damage the quartzite flooring. Thank you. The water from the snow should not hurt the quartzite. I would make sure that the floor is level and that it is sealed correctly. I am thinking of using engineered quartzite tiles for redoing my bathroom and kitchen floors. I understand that I should use a non- polished finish e.g. honed to maximize slip-resistance. 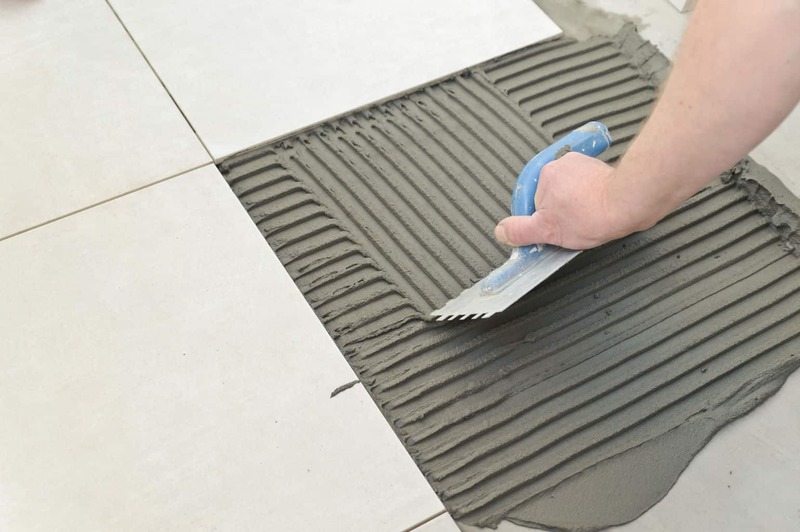 But are there special installation or floor preparation directions that I should be aware of, e.g., using only a particular kind of base (backer), mastic/thinset mortar, or grout? If so, what is the best type of base, sealer, adhesive, and grout to use for this application? Any special techniques? My main concern is preventing the tiles from shifting under pressure or popping off when walked on. Additionally, are there issues with hardness of engineered quartzite when used as flooring, and its ability to withstand pressure and wear, humidity, temperature changes, etc. that I should be concerned about? Any particular brands of quartzite tile that you would recommended more than others? Thanks so much for your help! I really appreciate it. Sorry, I do not have a brand to recommend on this product. An article that will help answer these questions for you is Installing Stone Flooring. I would also contact the manufacturer of the quartzite to find out their recommended base, sealer, adhesive, and grout for your item. We have Quartezite on an outside Patio. It’s has turned a dull gray. What can we apply to make it shine? I would clean the quartzite as described in the article above, and then apply a stone sealer to protect it. The stone can also be polished to bring out the shine. Is there a web site that can be trusted for properly naming slate and quartzite stone? I’m anticipating laying some quartz tiles on my kitchen floor. I was good to go to get some Starlight quartz tiles in the wake of accepting the specimen and I enjoy the look of them. I at that point detected the top notch quartz made by Compaq and thought about whether anyone knew what the distinction was? Is it true that they are truly twice as great? Is there anything amiss with the Starlight quartz at a sensible £4 a tile?